Molecular biology students successfully managed to isolate the DNA of some plant products in an experiment today, Monday 15 Jumada Al-Awwal 1440 A.H. 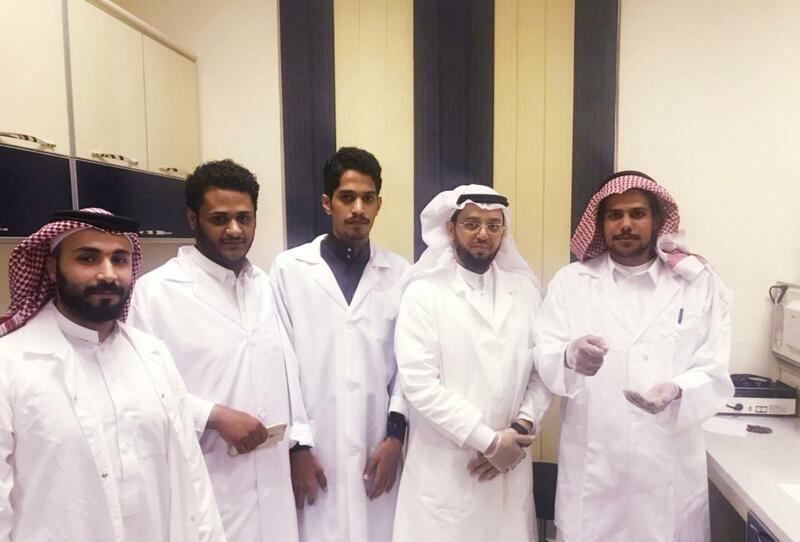 The experiment was conducted under the supervision of the course professor, Dr. Samir bin Hasan Qari, who indicated that these experiments enable the students to acquire several skills in the use of laboratory molecular techniques. Dr. Samir also confirmed that a series of laboratory molecular experiments will be conducted during the coming weeks according to the course contents. These experiments will include the isolation of DNA from human blood cells, and training students to electrically separate the DNA using gel. In addition, the students will be trained to use the PCR machine, and to make and photograph the DNA fingerprint of the chromosomes. In this context, His Excellency the Head of the Biology Department clarified that the department seeks to verify the DNA fingerprint of the plants growing in Jamoum with the participation of the department's prominent academic staff members.